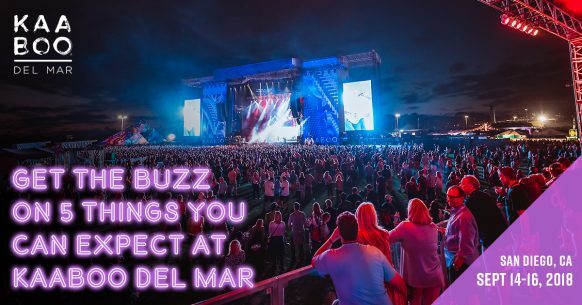 It feels like KAABOO Del Mar 2017 just happened yesterday, so it’s hard to believe that KAABOO 2018 event is just a few weeks away, taking place September 14-16, 2018. No need to panic, but now is the time to make your plans for San Diego! Now that we’ve got your attention, here are just a few reasons why you should escape to the warm shores of the Pacific this September. We also have hotel and pass packages available for you at the bottom of this post. Foo Fighters, Imagine Dragons, Katy Perry, Robert Plant & The Sensational Space Shifters, and more! This year’s KAABOO Del Mar lineup is the best one yet. Did you know Katy Perry was the first female artist to produce an album with 5 number one hits in the US? Or that Imagine Dragons were the second most streamed group on Spotify of 2017? Is your world rocked yet? You’re welcome. We know, it might seem hard to break away from the music, but don’t miss out on the comedy. This is not a joke! Humor Me is our indoor, seated comedy club, set right in the middle of the venue. Featuring some of the best names in witty banter, you’re guaranteed to fall out of your seat laughing. Want in on your favorite comedian? Who says you can’t eat well while listening to great live music? We wouldn’t be KAABOO without the enticing food we curate for you. At PALATE, you’ll find everything from the famous Poseidon Del Mar to authentic street tacos and vegan options, too. Best of all, you’ll get the opportunity to see world renowned chefs at the PALATE stage, and learn some new tricks you can use in your own kitchen. And remember, our Full Palate and general culinary lineup is out now. Did we make you hungry? Take a dip in the pool or layout in the sun to your heart’s content. Don’t worry about missing any of the acts you love, because BASK is located in direct view of the Grandview Stage! Chill out poolside, or turn the party up and challenge your friends to beach games, and enjoy an exclusive BASK bar. Come and go at your leisure when you purchase the BASK Day Pass. Each year at KAABOO is different, and a once-in-a-lifetime experience. Between rocking out to your favorite band, eating your way through the menu of tasty food, and getting lost in an ocean of contemporary art, it’s easy to be swept away by the good vibes. When you’re not jumping for joy along with the crowd, remember San Diego and all it has to offer to you and your squad. See you this fall for one wild ride! This entry was posted in San Diego Events and tagged entertainment, north coastal by Guest Blogger. Bookmark the permalink.